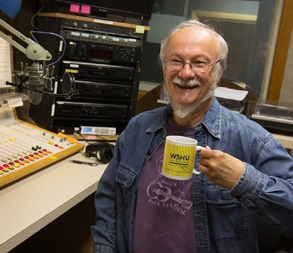 WSHU's Profiles in Folk began broadcasting in June, 1973. Throughout the entire time, it has been hosted by Steve Winters, a station volunteer. It's the longest running folk show on Connecticut radio. The show is an exploration of the diverse world of folk and acoustic music, with many of the weekly shows centered on a theme. As the show's title conveys, the program profiles the topic or the performers featured. At least ten shows each year feature live, in-studio showcases by performers, with interviews. webmaster's note: We are currently moving our archived live shows to this new website. Archived shows below this line may not be available yet. Our Links Page contains links to some of our favorite folk-oriented WWW sites, including artists often played on Profiles in Folk.